Hockey, as we've seen over the years on this blog, comes in many forms. There's the ubiquitous ice hockey whose hockey form gets the most coverage across this planet. Field hockey is also quite popular across Eurasia and the Australian continents, and HBIC usually gives Olympic years its due coverage. From there, we've seen sledge hockey, floor hockey, underwater hockey, air hockey, and a number of other forms that seem a little odd, yet have a following of dedicated players who regularly play and practice the game. Today, HBIC brings you another form of this great game that apparently has a following all over the world... and somehow has eluded my vision of the game! I'll be completely honest: I am ignorant of the rules and how the game is played, so let's go to the video! Ok, so Peter Searle, the uploader of said video to YouTube, seems to have a little fun with the dramatic introduction of the game, but watching that video seems to show that the game is a lot like regular ice hockey with a few notable exceptions. Let's take a look at some of the differences as documented in the game's official rules as per the governing body, the International Unicycling Federation. First off, there are five players to a side with a minimum of three players needed for each team to start a game. There are no goaltenders - each member of the team can play goaltender with no special privileges awarded to whomever is guarding the net at the time. 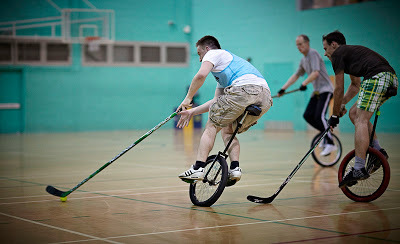 Any stick deemed legal for play in ice hockey is also legal for unicycle hockey except for the goaltender's stick which is not allowed in the game whatsoever. Sorry, ice hockey goalies - this game kind of excludes you. The equipment is pretty standard - shorts with kneepads or pants, shoes, gloves, helmets, dental protection, and a jersey or shirt of similar colours and markings as your teammates. It's the unicycle's measurements that seem to vary among players. The maximum diameter of the wheel is 24 inches, but it seems most players prefer a 20-inch wheel diameter for quick turns and bursts of acceleration. With my limited - read: none - experiences on unicycles, I wouldn't be able to tell you the differences and pro and cons between the wheel sizes. Just know that a two-foot diameter is your limit. There cannot be any protruding parts on the unicycle that could cause injury such as bolts or quick-release levers, and the pedals have to be made of plastic or rubber. Believe me, those metal pedals with the teeth on them leave a heckuva mark on your shins if you get dinged by them! The ball is a regular street hockey ball made of the hard rubber that leaves a welt when it hits you. Alternatively, a "dead" tennis ball can used. A dead tennis ball is one that bounces thirty to fifty percent of its original height when bounced. The only key is that the type of ball used must be attainable in all countries where unicycle hockey is played or it is removed from play. In the case of penalties, we see something similar to field hockey. All penalties result in a free shot from the point where the penalty occurred. However, according to the rules, "a team gets a free shot within the opponents' goal area, the free shot is done from the closest corner mark (corner shot). If a team gets a free shot within their own goal area, the free shot is done at a distance of 1 m in front of the goal line (goalkeeper's ball)." Again, this is somewhat like field hockey's rules for free shots. The free shot must be indirect and the player executing the free shot can only touch the ball once before another player touches the ball. Opposing players and sticks must remain two meters from the free shot location. But what if the penalty disrupts a scoring play, you ask? They have covered too. If legal playing would have led to a direct chance to score a goal, a "6.5 m" is given. This includes fouls outside the goal area. The ball is placed at the 6.5 m mark. A player of the defending team goes to the goal and must sit with the bottom of the wheel of their unicycle within 0.5 m of the goal line. The other team chooses a player to shoot the 6.5 m. All other players must leave the goal area. After the referee's whistle the goalkeeper must ride the unicycle freely and not rest on the goal. The attacking player has three seconds to make one shot. If no goal is scored, play continues as soon as the ball touches the post, the keeper touches the ball or the ball crosses the extended goal line. But wait, you say, if there are no goaltenders and it appears a team has a guaranteed goal, what about then? The rules account for that too! If the defending team prevents a goal from being scored through an illegal play of the ball and if, in the opinion of the referee, the ball was traveling directly toward the goal and would definitely have entered the goal without being touched by another player, a penalty goal may be awarded. In this case the attacking team is awarded a goal. If there is any doubt as to the certainty of a goal, a 6.5 m must be awarded as described in section 8.4.2. Basically, if your name isn't Patrik Stefan, there would almost certainly be a goal awarded. And, of course, if you're a real troublemaker on the court, they have rules for that too. Just play within the rules and everything will be alright. Alright? Good. The game is played in two 15-minute halves with a five-minute break between said halves. A bully - also known as a face-off in the hockey world - occurs at the center mark to start the half. If a game is tied after regulation time, there is another five-minute break followed by two five-minute halves with no break in between these extra halves. If still tied after the overtime periods, a penalty shootout will determine a winner. To play, one basically has to be able to ride the unicycle freely. If one dismounts or falls off, the rider must get back on the unicycle at the point of the dismount and can only return to play when both feet are back on the pedals. If a player appears to be an obstacle in the course of play, that player must allow the play to play through without being an obstacle before returning to play on the unicycle. Basically, if you fall, don't be a speed bump. The good news is that any part of the player, stick, and unicycle is legal in terms of playing the ball, but players cannot play the ball with the body in successive contacts. In other words, no knocking the ball down to a foot to redirect the ball as an example. Players are also not allowed to catch the ball at any time - open hands must knock the back down. If a ball gets caught in the spokes of a unicycle, the opposing team gets a free shot. And just like all forms of hockey, a goal cannot be scored if the ball is directed in off the hands or arms. Any player defending the net that moves the net will also give the opposing team a free shot. Any player who is caught dropping or throwing a stick intentionally will serve a two-minute penalty off the court without substitution as well as giving the opposition a 6.5 m free shot. Unlike ice hockey, the game is played with as little contact as possible. Sticks raised above the hips indicate "exaggerated roughness", and players are not permitted to stick check opponents with any over-exertion of effort. Flipping the blade of the stick downwards is also prohibited. Players cannot push one another to knock opponents off-course, and players who have the ball have the right of way in almost all cases. The only player who can stop a player from traveling in a straight line is one who is idling or resting on one's stick. Ultimately, it is the referee who will determine right-of-way in the majority of these cases. There are, of course, two major cases where a stick infraction could be dangerous: stick under bike (SUB) or stick in bike (SIB). If a player "subs" or "sibs" his opponent, it is an automatic foul regardless of intention. The result would be a free shot or a 6.5 m free shot depending on the foul's location. Aside from those stated rules in these last two paragraphs, everything else that constitutes gentlemanly play would apply in unicycle hockey as well. The only other rule that stands out is the "long shot" rule. A goal is disallowed if the ball was shot from one's own half and was not touched by anyone afterwards. The defending team gets a free shot (goalkeeper's ball). This rule does not apply if the ball is shot from the opponents' half into one's own goal. Basically, like field hockey, one has to cross the half if one wants to score on one's own. Otherwise, the deflection play might be a routinely-called option if there's a need for a quick goal. Unbeknownst to me, there are three countries with national unicycle hockey leagues: Australia (8 teams), Germany (53 teams! ), and Switzerland (20 teams). England, France, Denmark, Sweden, Hong Kong, Singapore, and Korea also have organized clubs that play regularly within those countries as the popularity of the sport seems to be similar to that of field hockey nations. In most nations, the club competitions feature teams of mixed genders, but the major unicycle hockey leagues consist mostly of men against men competitions. Needless to say, this could be the first sport that doesn't separate the men and the women during competitive play! I think that's an incredible feature of the sport, so here's hoping that remains a part of the game! And with that, we have another version of hockey covered! I've never seen or even heard of it being organized in my area, but I might have to see if there's any sort of underground action of which I'm not aware. If you've seen or played the game, contact me here! I'd love to hear more about it!